8-25-2018 A Blush Bouquet for a Blushing Bride! Kara and Brett’s wedding on 8/25/2018 was all about blush, ivory, and white colors. Mini calla lilies and blush pink roses were part of her bouquet. The same color scheme, of white hydrangea and blush pink roses provided lush, full center pieces for the middle of the guests’ tables. Kara’s 12 bridesmaids carried white hydrangea, which softly stood out against their blush pink dresses. The band played well into the night. We hope that a great time was had by all, and wish the best of luck to our newlyweds! This entry was posted on September 5, 2018, in Weddings - 2018 and tagged blush pink, blush pink wedding, bouquet, bridal bouquet, calla lilies, hydrangea, Roses, wedding. As 2017 drew to a close, we were somewhat nostalgic, yet very happy for our year end brides. Our 12/29/17 bride chose a very full but traditional look to compliment her long sleeved lace dress. Sahara roses, Patience garden roses, Vendella roses, red hypericum berries, and gold eucalyptus accents came together nicely into a loose round shape. 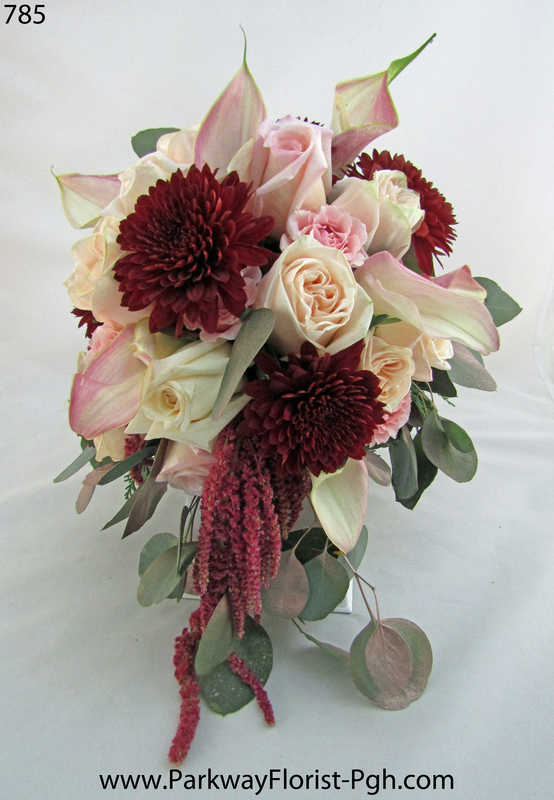 Andrea, our Saturday bride carried some of the same flowers but also included pink mini callas, maroon amaranthus , and dark mums. Rose Gold was the accent color which displayed nicely in the pink accented ballroom. One of our New Year’s Eve brides chose to be married under our brass arch with similar flowers. After the ceremony concluded and pictures were finished, the flowers were transferred to the head table. So, as 2017 drew to a close, we gather one last time to wish all of our 2017 brides and grooms a heartfelt congratulations and best wishes for your new lives ahead. Thank you all for allowing Parkway Florist to be part of your special day. And we look forward to what 2018 has in store for us as well! 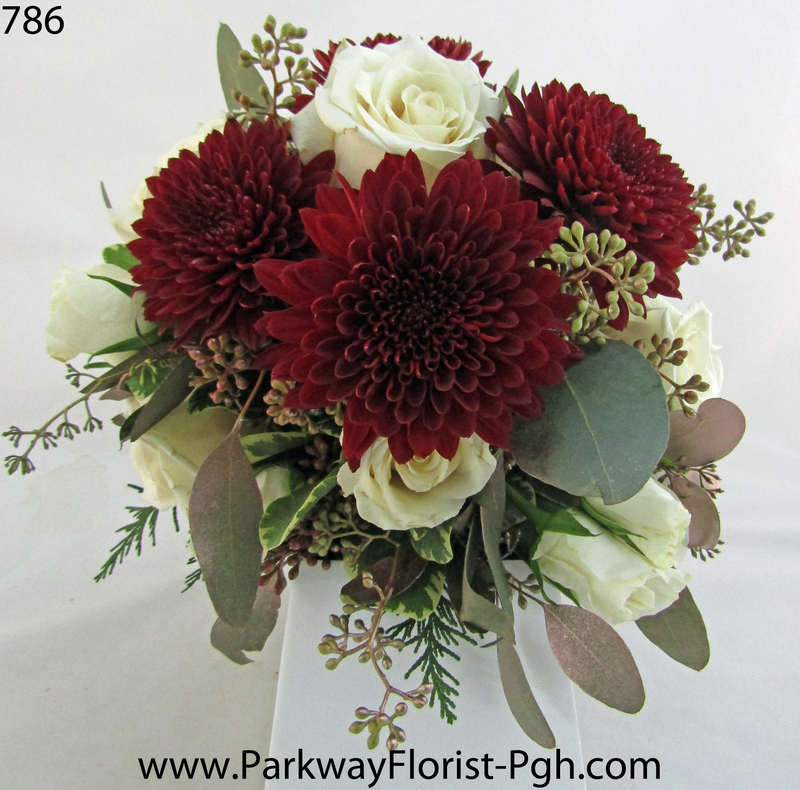 This entry was posted on January 2, 2018, in Weddings - 2017 and tagged Bridal Bouquets, Bridesmaids Bouquets, calla lilies, centerpieces, Classic Wedding Flowers, New Year's Eve Weddings, parkway florist pittsburgh, pittsburgh wedding flowers, pittsburgh weddings, Rose Gold, Roses, wedding arch, wedding flowers, Winter Wedding Flowers. It’s almost fall! With this Friday, September 22 marking the autumn equinox, we are patiently awaiting fall’s official arrival. We can always tell that fall is nearly here when the rich jewel tones of purple are a part of three weddings that we produce in one weekend! 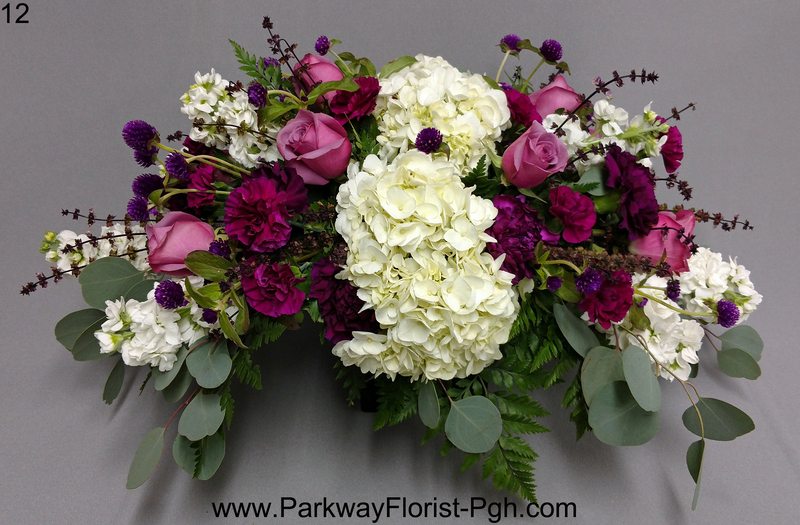 This past weekend was a display of rich color that makes everyone at Parkway Florist look forward to all of what fall has to offer. 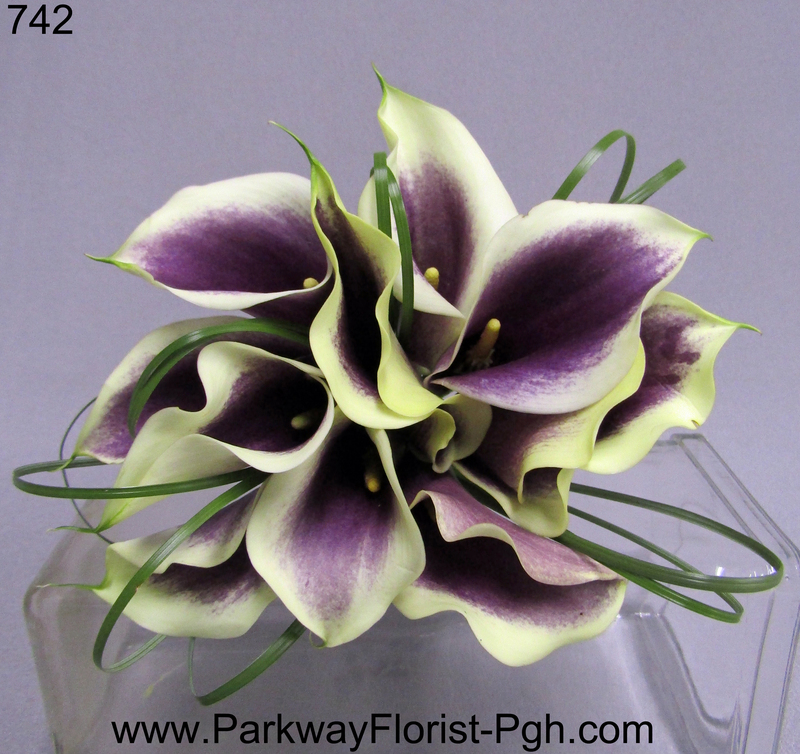 Our first bride chose Picasso Mini Callas for her wedding flowers. An outdoor ceremony at the Doubletree Pittsburgh Airport Hotel in Moon Township was the perfect setting for a gorgeous mid-September wedding day. White lanterns adorned their guest tables to provide a romantic ambiance. Our second Purple wedding took place as St. Andrew Lutheran Church in Moon Twp, with a wonderful reception at the Montour Heights Country Club. 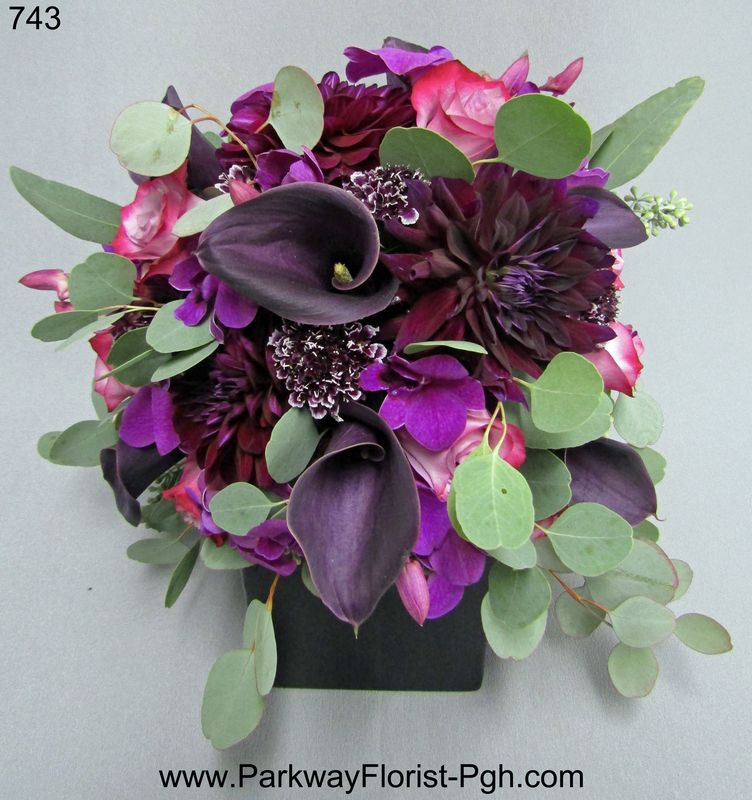 Ben and Rachel chose varying shades of eggplant as the wedding colors. Lush, full centerpieces were a perfect compliment to their reception decor. Ben and Rachel were able to share a few quiet moments as their sweetheart table which was also decorated with a beautiful centerpiece. 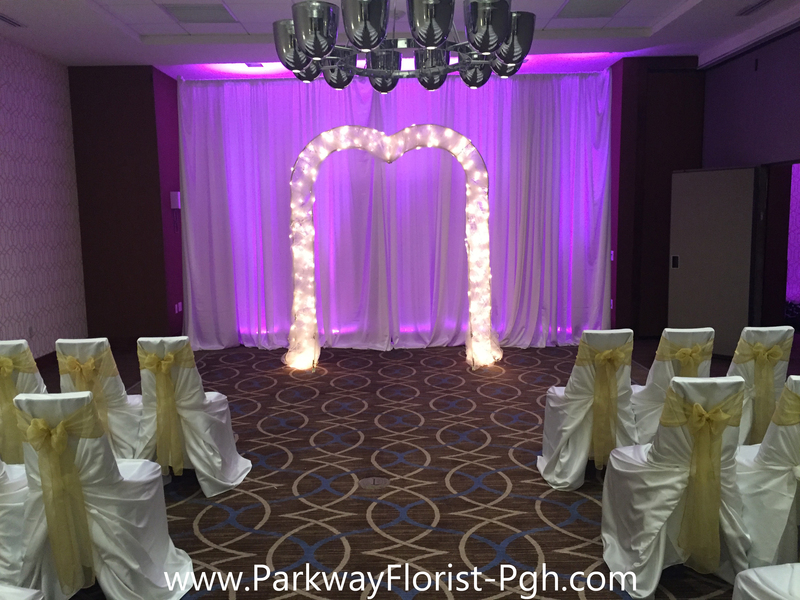 Our last purple wedding of the day took place at the Sheraton Pittsburgh Airport Hotel in Moon Twp. 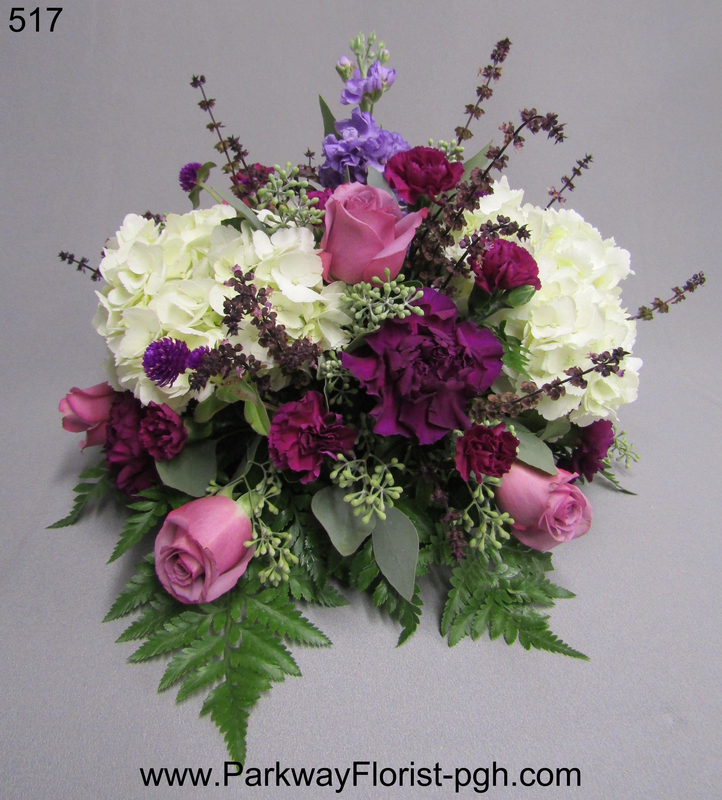 Nicole and Kyle also chose plum/purple as their wedding color. 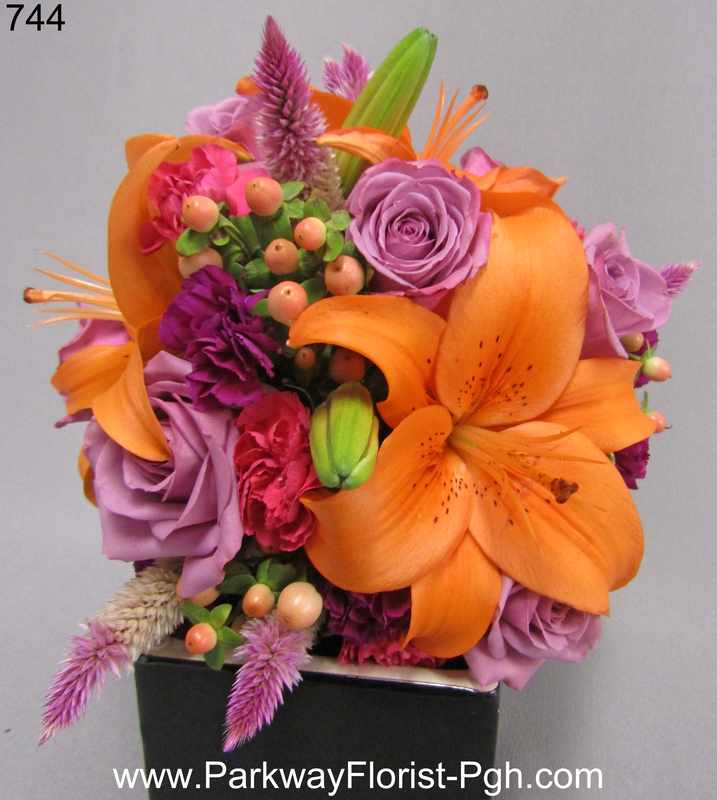 However, they chose to accent with orange, hot pink, and lavender (bright & bold!) The Picasso mini callas were carried by our bride, while the bridesmaids carried all the bright & bold colors. Our lighted brass arch did double duty, serving as a ceremony backdrop and then repurposed to frame the bride & groom behind the head table. 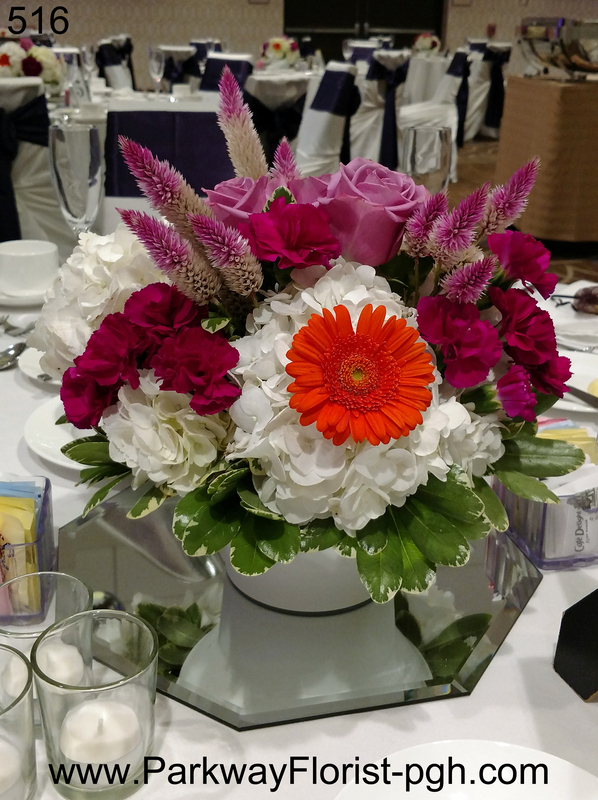 Centerpieces also pulled in bright & bold elements. Congratulations to all our brides and grooms who chose to hold their wedding in the Fall season in a variety of similar but different ways. 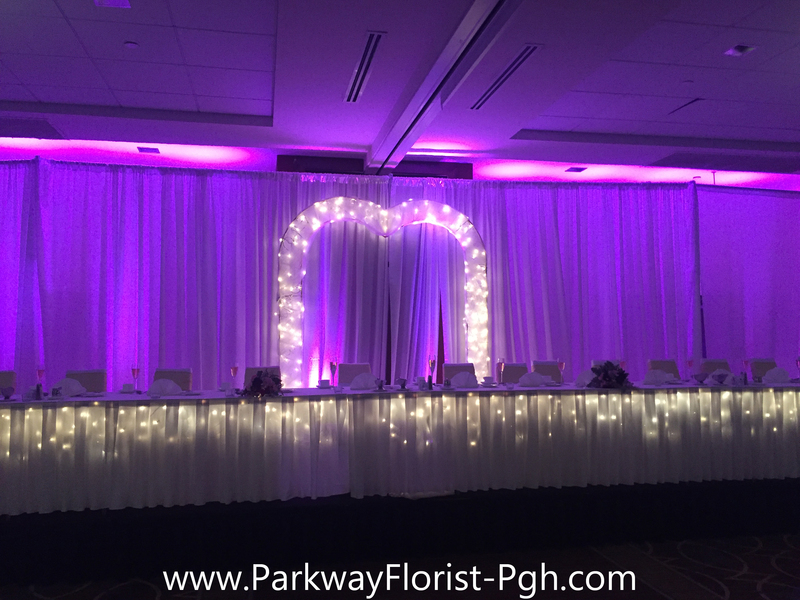 This entry was posted on September 19, 2017, in Weddings - 2017 and tagged 2017 wedding, calla lilies, Colorful Wedding Flowers, dahlias, Doubletree Pittsburgh Airport Hotel Wedding, fall wedding, Montour Heights Country Club Wedding, pittsburgh wedding flowers, pittsburgh weddings, Purple wedding, purple wedding flowers, September Wedding, St Andrew Lutheran Church Wedding, wedding arch. On Saturday, July 9th, we had the pleasure of providing our bride Deanna with very classic flowers for her up-scale Wedding. The ceremony took place at Duquesne University’s Chapel, with a full Catholic mass and was followed by an evening reception at the Pittsburgh Airport Marriott located in Moon Township. Deanna asked us to create a “classic and clean” look for her. She loved Callas!! We supplied large clear glass urns, filled with full-sized, open cut calla lilies at the Chapel. The bridesmaids all carried a clutch of 4 large callas, as well. Deanna’s bouquet consisted of 36 miniature white callas, which complimented her very stylish dress nicely. After the ceremony, the large urns of callas were moved to the reception to decorate the luscious Pittsburgh cookie tables that flanked each side of the ballroom. Huge clouds of white hydrangea were suspended over each guest table as a centerpiece. The accents of silver branches incorporated into the centerpieces drew the eyes to the twinkling lights on the ceiling. A grand time was had by all (as we have been told). Congratulations to Deanna and Mark! Below are some pictures from Deanna’s wedding. Take a look at the big and beautiful calla lilies! 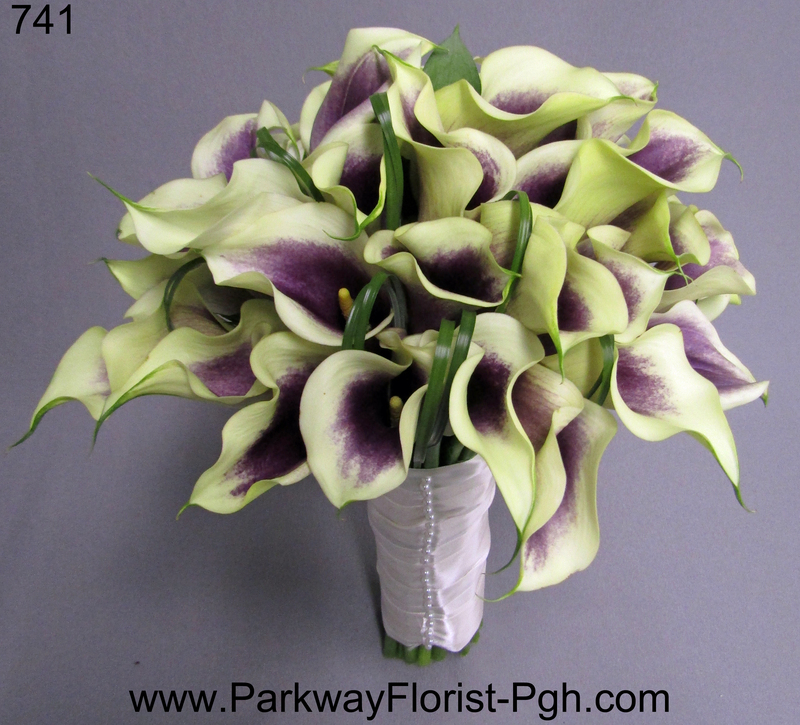 This entry was posted on July 10, 2011, in Ideas & Arrangements and tagged calla lilies, Callas, classy, clouds, Deanna Martin, duquesne, Duquesne University Chapel, hydrangea, Hydrangea centerpieces, pittsburgh, Pittsburgh Airport Marriott.